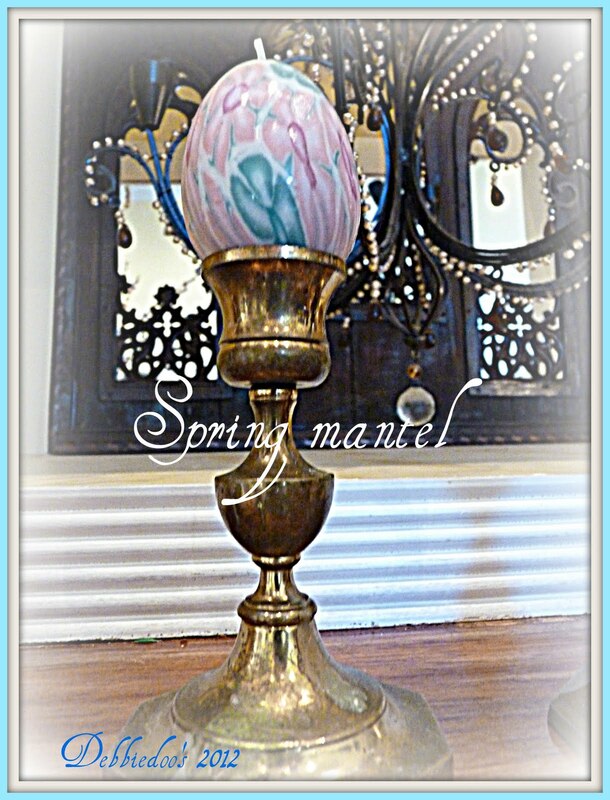 Your Spring mantel is really pretty! I love the egg garland. I've changed my Spring mantel a few times already,as well! looks beautiful Debbie, love the look. Debbie, your mantel is very striking. I like that it's unique to fit your room. 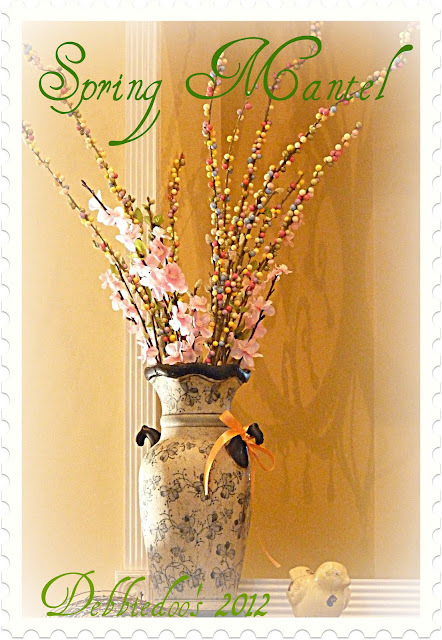 Twiggy garland is a favorite of mine any season. That's cute and pastels don't work here either. Very sweet looking mantel. I love those candle eggs. I like your little egg garland strung across the mantel. I find that when you can't work with a certain color, then just go neutral using the same ideas. Then you're safe and don't feel like it's so out of place in your room. I think that's why there are so many different color schemes for Christmas decor now. It looks great Debbie!!! 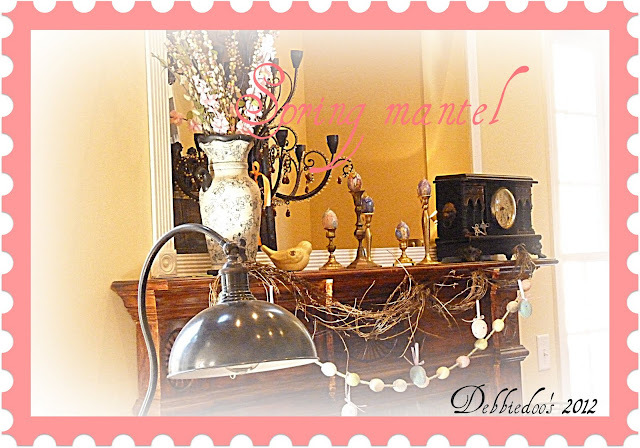 I love the egg garland swagged over the mantel. I have those same egg candles and I've never lit them either. Still very cute mantel! Your eggs on the candlesticks are adorable! Thanks for sharing!! 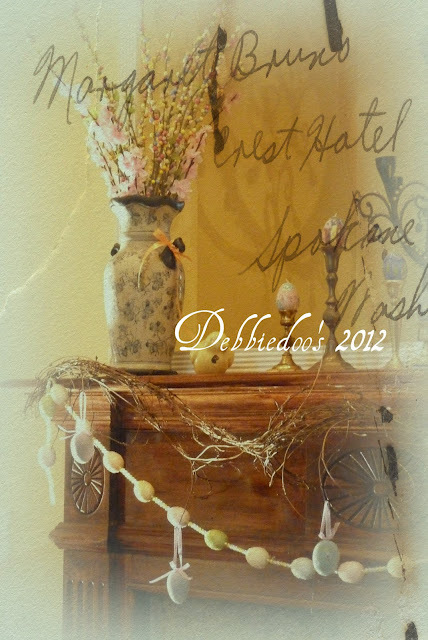 Your mantel looks pretty, Debbie! Perfectly Spring-like! The candle eggs are great. Don't think pastels work on mine either. I'm not really sure what does work on mine. I have a St. Patricks thing going on right now and I wanted to change it for the mantel party, but looks like I won't be home to do that. So.... better the way it is than not at all. Love the floral arrangement. The eggs on the candlesticks look great. Hi Debbie Dear! I just love your mantel and it's as cute as a bunny's ear! :) That egg garland is so cute. Looks great, Debbie. It has your personality all over it, eggsactly. Debbie...you always have some really unique things. I love it all and the egg candles on top of candle holders are just sweetest! Your mantel looks great! Love those eggs, they don't look like candles at all, very cool! P.S. Don't know if I mentioned it, I worked on my blog re: emails again...seems to be working. Who knows? Are ya' kidding ... it's *eggzactly* perfect! Love the eggs and how you perched them ... and the garland is awesome (especially with the grapevine mixed in, too)! Great job, friend! Debbie, it looks so pretty! I love the candle eggs! And the garland is beautiful! 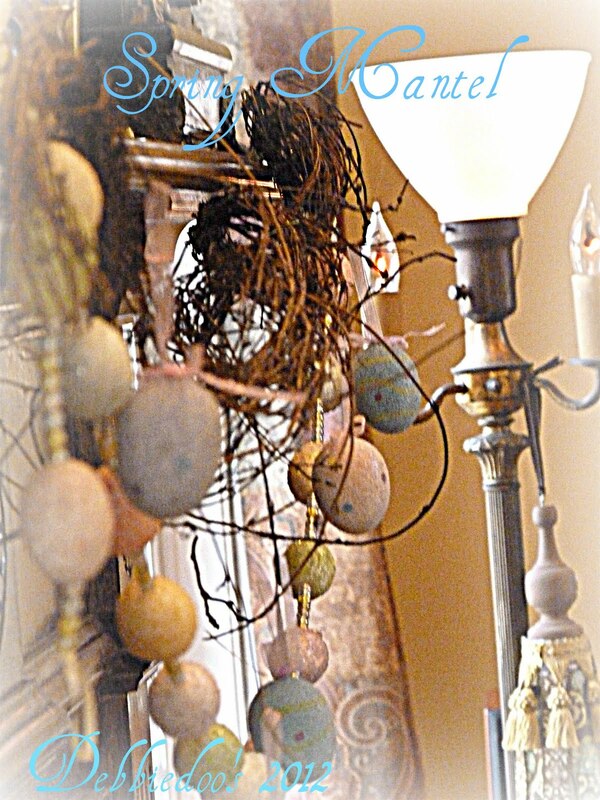 I love the eggs on the candle sticks...such a great idea! 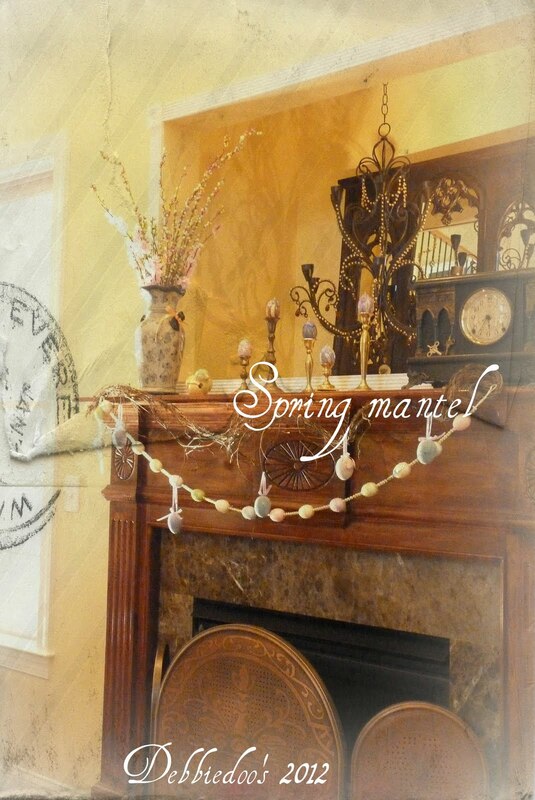 What a cute spring mantle! 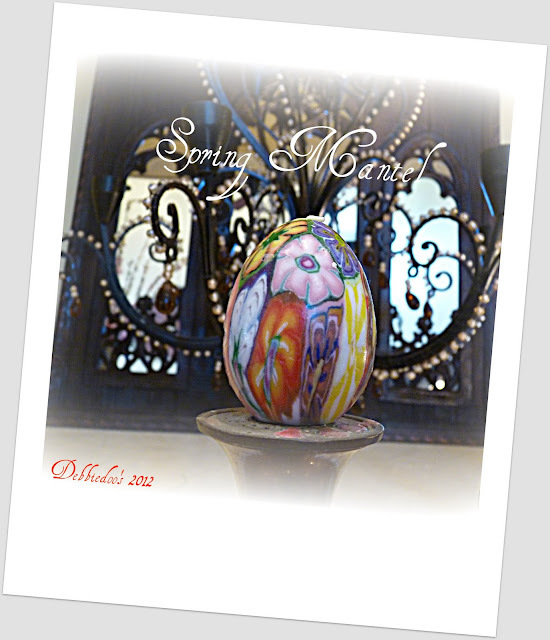 I love those candle eggs, so pretty. I wouldn't want to burn them either. New to me that I love is the egg candles and the egg banner, Debbie! Usually you see the egg wreaths but I haven't seen a garland/banner before. Love the tall bits in the vase. I'm not much on pastels either, but your mantel turned out great. Your mantel is so pretty! I love how you're always changing things up. Love the egg garland! Thanks for sharing. Love your mantel, Debbie. I think everything you touch turns to `pretty`! I really like the multi colored (not sure what to call them) sticks(?) in the vase. Unique. Debbie, I think your mantel is gorgeous! I love the egg theme! The flowers add such a colorful touch! The egg garland is great too! It's so bright and fresh! The garland is so sweet too! I just love your mantel. I especially love the candle eggs. I wouldn't light them either. 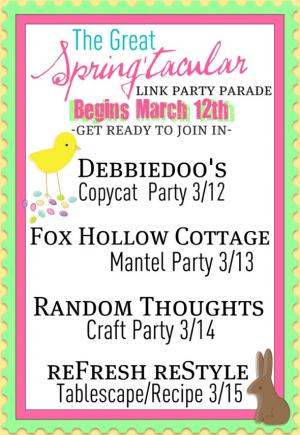 It's fun and festive, pastels and all! Love your eggs on candlesticks! Looks nice! I have mine decorated with St. Patty's so I need to get on it this weekend! Have a wonderful day! Looks really good, The eggs on the candlesticks were great. Aww! I'm sorry it's not what you were hoping for but I think it looks egg-cellent! LOL! I agree completely about your candle eggs. They certainly do look like porcelain. I would never have guessed they were candles if you hadn't said so. Your egg garland is adorable too! Very cute! I love it! All the eggs are awesome! Hi Debbie, I'm you're neighbor at Kim's party...LOL! It's just so fun & totally fits your personality. I love it! Thank you for sharing. It's gorgeous. I think it's so cool that you have kept those egg candles without lighting them. They are pretty perfect on the candlesticks too. Great job as always! Debbie, I love your mantel...you always do a great job on everything you do! What in the world are we going to do when Picnik is gone??? I had only discovered it less than a month before they made the awful announcement. Any word on a similar type program??? Well it may not be what you imagined but it is lovely! The details are fabulous! I am loving this look!! Hello there.....I'm still alive and breathing..barely, very sick down in the desert this week...horrible cold on the couch for a week, some vacation huh? anyway checking out your blog and I am just loving all this brilliant photography you are doing...very cool Deb!